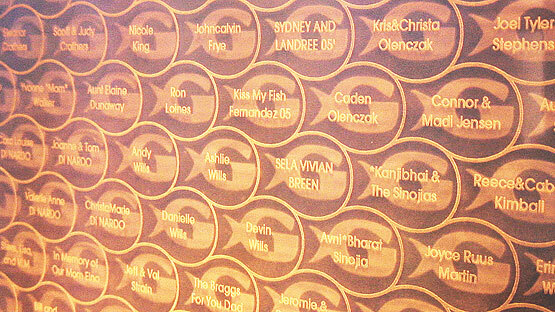 "Our interactive Fish Scale wall was a very important way for us to connect with Atlantans and supporters from all across the USA. PlayMotion's creative concept was a key reason for our success." -- Beach Clark, the Georgia Aquarium. 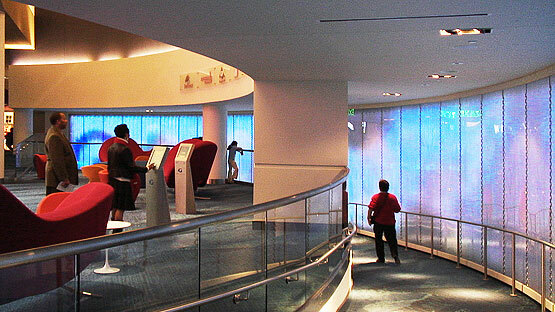 The Georgia Aquarium began as a concept in 2003, aiming for a scheduled grand opening in 2006. It is the world's largest aquarium, located in the heart of Atlanta, Georgia, situated on the periphery of a large public park built to honor the 1996 Olympics. The aquarium, which represented a $250 million dollar gift to the city and the region, desired to build a bridge to the community it served. PlayMotion was enlisted to create a unique, interactive donor recognition sculpture to honor the 35,000 citizens who chose to contribute personal funds to the building of the Aquarium. The goal was to transcend the typical "engraved brick" and "brass plaque" programs, and to create movement and interaction that truly honored and engaged with the donors. 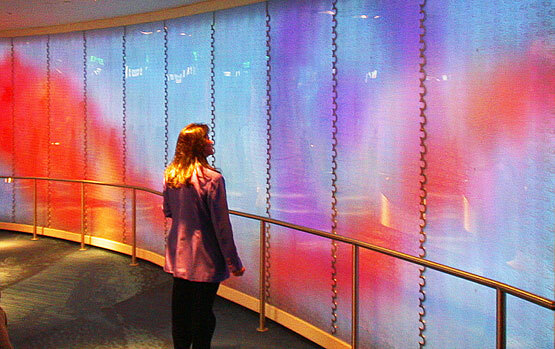 PlayMotion responded by designing, developing, programming, and supervising construction of an 80-foot long custom etched LED wall. Upon entering the central rotunda, guests are able to look up their names or donor messages on one of two touch screen kiosks. 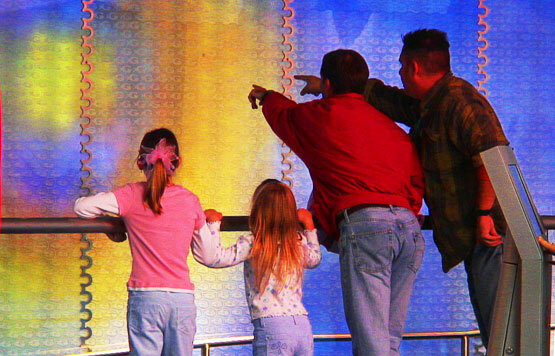 Upon confirmation, they are prompted to look up at the massive donor wall, which simultaneously comes to life with a large "tinkerbell" style comet animation that spans the entire 80 foot display surface, finally coming to land on their individual tile. An 8' diameter beacon then gently throbs and condenses, drawing the viewer right into the precise location of their scale, and giving them the time they need to descend the ramp and find their name. 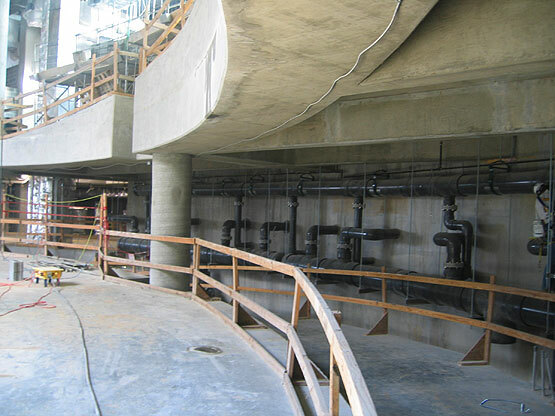 This project was completed in partnership with both the Georgia Aquairium as well as Entertainment Design Group, Heery Construction, Color Kinetics Lighting Systems, and Lasertech Engraving. Over 35,000 inidividual scales honored contributors to the building of the world's largest aquarium. The wall in October 2004, during pre-construction planning and concepting phase. A family sees the locator beacon throb atop their scale.